This week Flavorwire listed the ten most essential Civil Rights photographers. As we looked at the photos, We wanted to focus on Bill Hudson, an Associated Press photographer at that time. His images reminds us of the Arab Spring that shocked the world in 2011. Freedom doesn’t come without struggle. As we begin this new year, it is our hope that we can move from protest to real action that would lead to real hope. 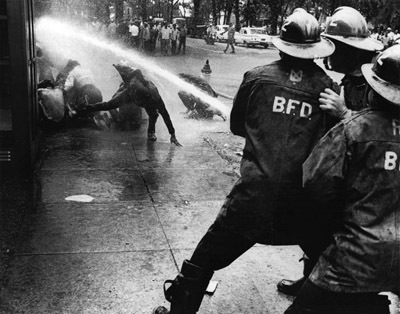 On July 15, 1963, photographer Bill Hudson snapped this photograph as members of the Birmingham Fire Department turned their hoses full force on civil rights demonstrators. It wasn’t the first time that Hudson and other photographers and cameramen of the era captured such striking images that stirred the nation’s moral consciousness and inspired national and international support for the black struggle for equal rights. In an interview years later, Hudson said that his only priorities were “making pictures and staying alive” and not getting hit by one of those high-pressure water hoses or bit by a dog. In the spring of 1963, Martin Luther King, Jr. and the Southern Christian Leadership Coalition led a strategic campaign in Birmingham, Alabama that was aimed at ending the city’s segregation policies and practices. Through sit-ins, kneel-ins, boycotts, marches, and mass meetings, demonstrators also hoped to pressure business leader s to open retail jobs and employment to people of all races. 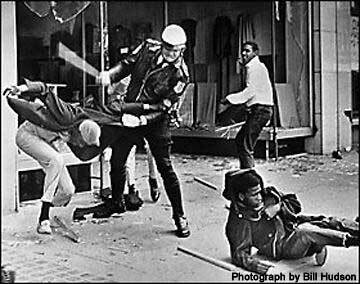 By intentionally provoking arrest through non-violent direct action, King believed that if they could “crack Birmingham” then they could “crack the South” and dismantle Jim Crow. Birmingham’s Police Commissioner Eugene “Bull” Connor, a staunch segregationist, promised bloodshed if demonstrators continued to defy the law. When the city’s jails became crowded with thousands of demonstrators and there weren’t enough squad cars to make arrests, Conner, whose authority extended to the fire department, ordered hoses to be turned on demonstrators. To Connor’s surprise, and to the dismay of the Kennedy administration and some black civil rights leaders, King and local leaders of the SCLC, in a controversial move, recruited children as young as eight years old to participate in demonstrations. They were taught how to protect their heads, huddle together on the ground when hit with water jet, and how to be arrested. Hudson and other cameramen captured images of young demonstrators clutching poles, being sprayed against store windows, and women being lifted over the tops of cars. They took shots of young boys’ shirts being ripped off and their bodies being rolled down the streets water pressure set at a level that was strong enough to peel bark off trees and separate brick from mortar. In the backgrounds of these images, onlookers can sometimes be seen taunting police officers and firefighters, and tossing broken concrete, rocks and bottles in a futile effort to stop the abuse by authorities. And other times, as in the case of the photo captured above, blacks can be seen behind the strong white mist with their hands on their hips, shoulders dropped, and hands by their side, helpless and perhaps contemplating the irony that the very people who were supposed to protect the public had become villains.